I never expected drowning could be a climbing-related hazard. Falling, yes. Being hit on the head by a chunk of rock, ok. Getting caught in a blizzard and being forced to dig a hole in a snowbank to make an ice cave – fair enough. But drowning? I’m back in the Rockies and hanging out with people who are obsessed with waterfalls – though, not in their free-flowing gushing, exuberant moving state. This crowd of ice climbers can’t wait until it gets really cold and waterfalls become icefalls. And, these folks are eager beavers, so at the first sign of ice, off we went on an expedition to Grotto Falls near Canmore. Needless to say, ice climbing requires some special tools. First off, lots of layers – it can be chilly standing around waiting for your turn to climb, so puffy jackets and thick gloves are the order of the day. Once moving, though, layers come off and, just like with any kind of climbing, one quickly heats up. Thinner gloves are in order once you get going (you still need to be able to feel what you are doing, even while trying to keep your digits from freezing). Unlike climbing rock, you don’t generally grab onto the ice to help haul yourself up to the top. Instead, ice tools become extensions to your upper limbs and, instead of rock shoes, you wear heavy mountaineering boots designed to be worn with crampons. 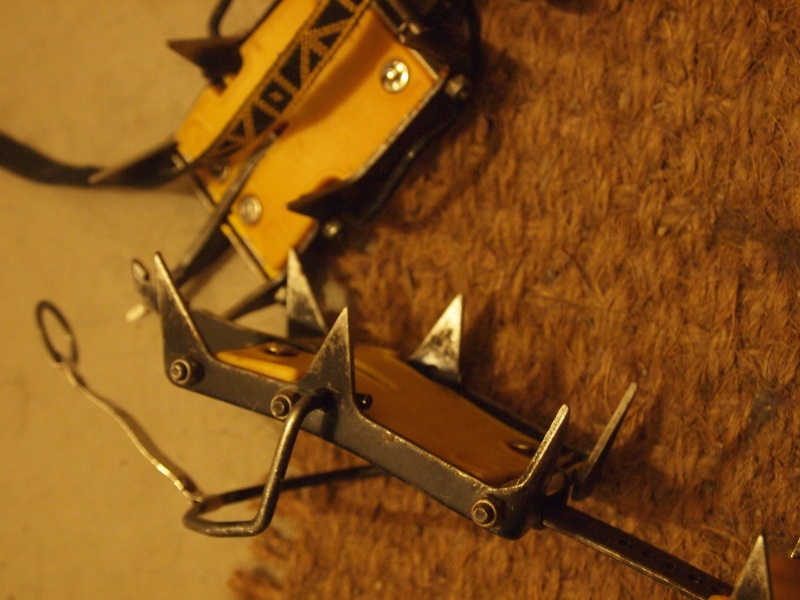 Crampons are the most awkward devices ever invented, bristling with spikes they are just as happy as to shred your trouser legs as bite into the ice. 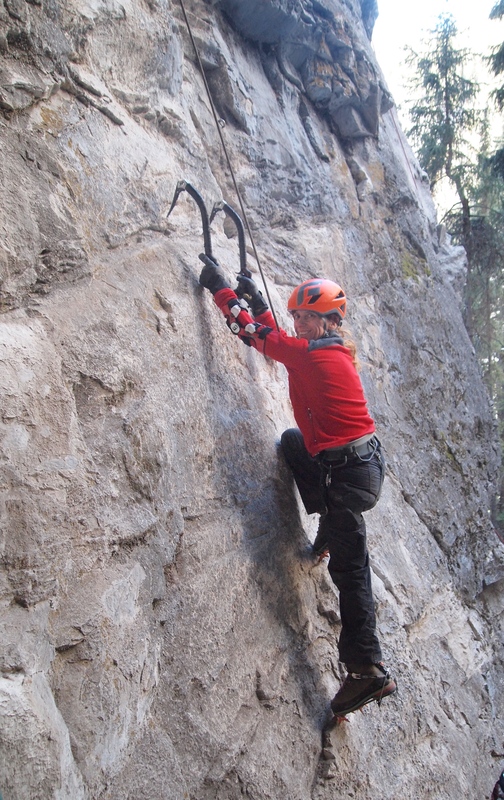 Fortunately, for those of us who have no experience with crampons, ice tools, or climbing with a gazillion layers, there is a shoulder season sport known as dry-tooling. Those who simply cannot wait until the ice is ready (or, those who want to get those tool-hefting muscles into shape) head for certain crags where tool use is encouraged. There, crampon tips nudge gently into teeny weeny divots (you call that a toe-hold??) and ice tools balance on precarious lips of rock or wedge behind flakes and act like handles used to balance and pull up while one finds new, better, toe-holes for the blades strapped to your feet. 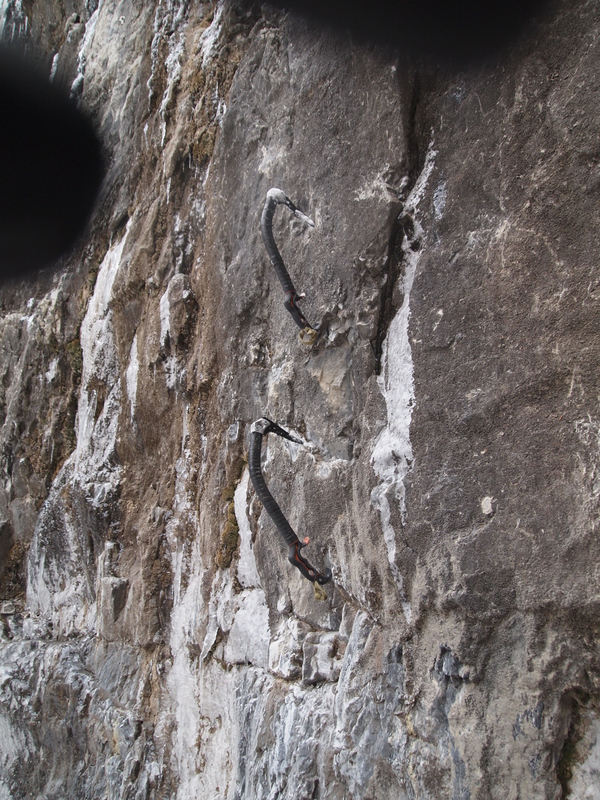 Occasionally, a tool gets so firmly wedged in a crack that it takes some effort (in this case on the part of both climber and dancing belayer) to extricate the serrated edge without snapping something. 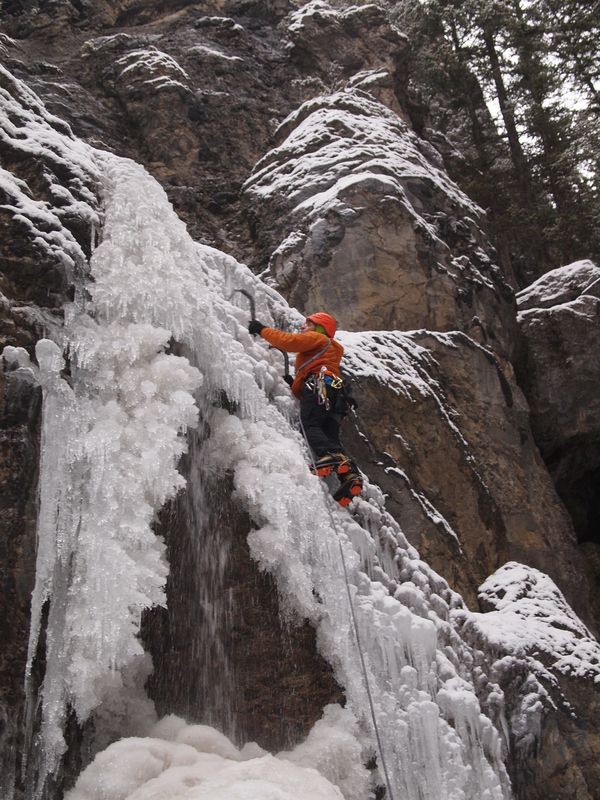 We went dry-tooling a couple of times at a place called the Playground (near Exshaw) so at least when we tackled Grotto Falls I had held ice tools before and had some idea of the theory behind ice climbing. I must confess I was a tad surprised when we got to Grotto Falls and found that they were still falling – gushing, actually. Yes, there was ice forming on either side and more ice higher up in the chute between the two rock faces where the water had cut its channel, but there was still plenty of water tumbling over the rocks. It was beautiful, no doubt, and probably the kind of thing sensible people might stop to photograph. We, however, decided to try our hand at climbing what turned out to be a bit of a vertical Slushie. 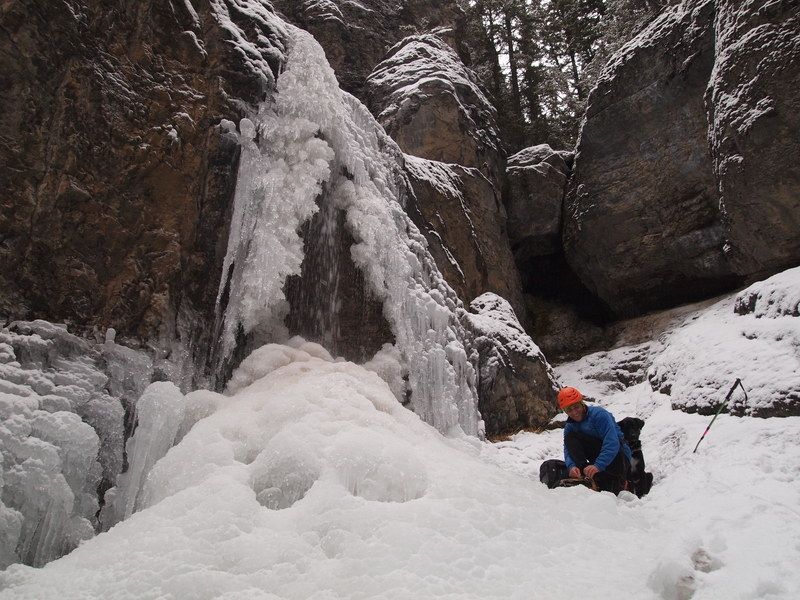 The ice was soft in places and not very thick, so I was told to softly place my tools more like I had been doing while dry-tooling (rather than taking a good hard swing as one would do when the ice is nice and thick). Nerve-wracking? Yes. It felt a bit like climbing up over a frosty mound of delicate eggs as I picked my way up the ice. Every time I jabbed at the ice with my crampons or placed my ice tools I was a bit worried the ice would dislodge and fall off the rock face. I have never climbed so gently! Often, water was visible beneath the ice, still roaring its way down toward the bottom. Where the rock chute narrowed and the water volume increased, there was a lot of spray and in a couple of places, no other option but to keep climbing what ice there was while being spritzed in the face with a decidedly chilly shower! Halfway up, a pool that becomes a sturdy belay station in the depths of winter was, beneath a tempting ice crust, still very much a pool. A rather cold pool, which I discovered is about waist deep when one falls into it. My plunge into the icy water happened on my way down when I was being lowered and I slithered off the steep, slick walls of the bowl holding said pool. I must say it is a bit of a shock to find oneself paddling in bubbling water, ice blocks bumping into you, boots rapidly filling with water. Flailing about with my ice tools, trying to hook them on something solid enough to haul myself back out of the pool, I found myself pondering the likelihood of drowning while climbing. At the same time I had to marvel at how effectively my waterproof over-pants were keeping me sort of dryish. Fortunately, I managed to scramble over the bottom lip of the pool and continue my descent unscathed, if a bit soggy. Was it fun? (Which, really, is the only thing that matters…) I have to say it was actually most excellent, in a bizarre kind of way. 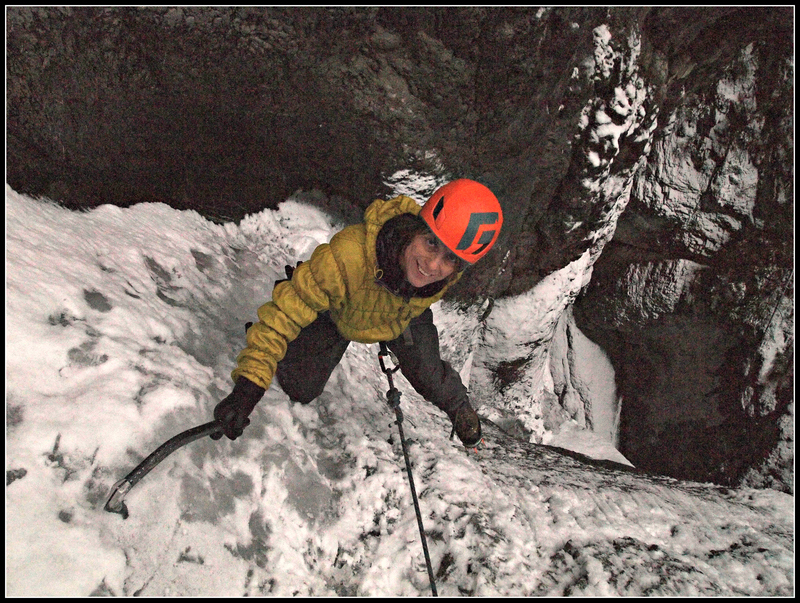 It certainly whets my appetite for more ice climbing! For the first time in my life I find I am actually crossing my fingers for some colder temperatures to arrive!